Working with hazardous materials is a dangerous occupation for the employee and a release can be devastating to the environment. 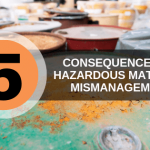 It’s important to not only understand the implications of what would happen should there be an accidental release of said hazardous material but what to do in that event. That’s where HAZWOPER comes into play. HAZWOPER stands for “Hazardous Waste Operations and Emergency Response” and is a vital training resource that provides entities and employees who handle hazardous materials with the basic knowledge of what to do in an emergency situation. These “emergency responses” deal with situations where there is an uncontrolled release of any hazardous material. General site workers are required to complete 40 hours of HAZWOPER classroom training along with three full days of documented experience in the field. Occasional site workers are required to finish 24 hours of training combined with one full day of documented experience in the field. 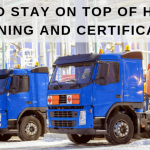 The Occupational Safety and Health Administration (OSHA) requires that both general and occasional site workers complete eight hours of training each year to refresh their knowledge. 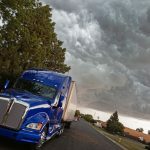 It’s extremely important that both employees and the environment are protected when handling hazardous materials and receiving the proper training and education on what to do in emergency situations is paramount to that objective. 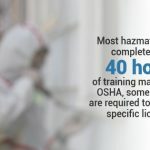 *Note that 40-Hour HAZWOPER training cannot be done completely online. There is a requirement by OSHA that the last 16 hours be done as hands-on training.